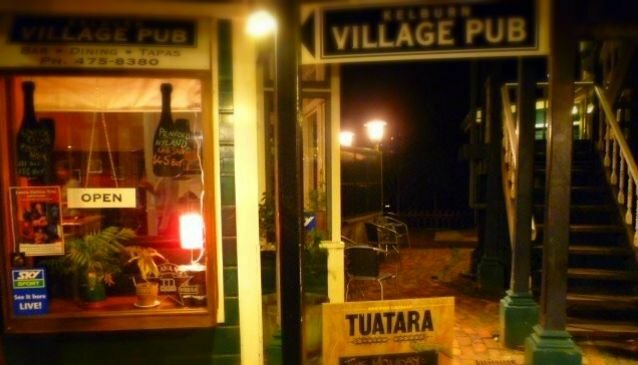 Kelburn Village Pub is situated close to the top of the Wellington Cable Car, in the village of Kelburn. The food on offer includes tapas dishes of Quesadillas, pan fried prawns, nachos, fish goujons and Jamaican Jerk Chicken Wings. For those lookiing for something more substantial, the menu includes asian style pork belly, sirloin steak, thai coconut and vegetable curry and moroccan lamb burger. On sundays, a sunday roast is served. A daily happy hour runs from 5.00pm to 6.00pm which includes free popcorn. During the week there are food specials. The pub has SKY TV and a pool table.